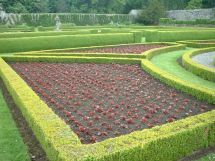 Approximately 1 mile west of Pitmedden on the A920 lies the historic gardens, originally laid out in 1675 by Sir Alexander Seton, 1st Baronet of Pitmedden. 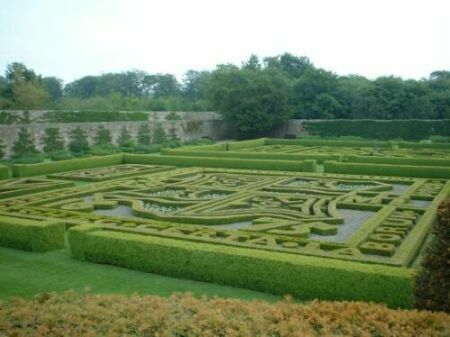 Famous for it's displays using box hedges and bedding plants. Owned by the National Trust for Scotland. 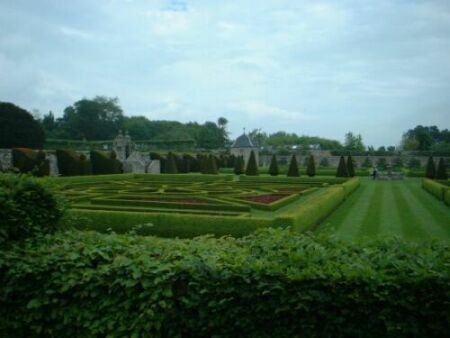 The centrepiece of this property is the Great Garden, three of the formal parterres were taken from designs possibly used in the gardens at the Palace of Holyroodhouse, Edinburgh in 1647. The fourth parterre is a heraldic design based on Sir Alexander's coat-of-arms. In the 1950s re-creation of the elaborate floral designs under the guidance of the late Dr James Richardson, along with George Barron, was undertaken, to give the gardens we know today..
Also on the 100 acre estate is the Museum of Farming Life, Visitor Centre, cafe, herb and wildlife gardens. Also, new, for the 2003 season, a series of sculptures by local artists are on display in the gardens.